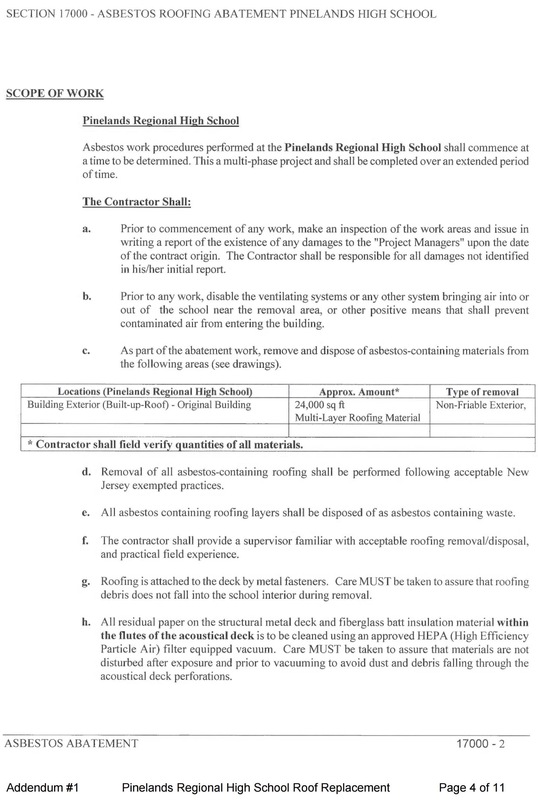 This is part of an ongoing series documenting asbestos mishandling and other contractual violations at Pinelands Regional High School. Please support independent journalism: Contribute financially to Citizens’ Media TV, or buy a t-shirt or tchochke. LITTLE EGG HARBOR, NJ – At Pinelands Regional High School in 2017, there were two times when asbestos was removed from the roof. The first was at the beginning of the project, when asbestos removal was supposed to happen in full. 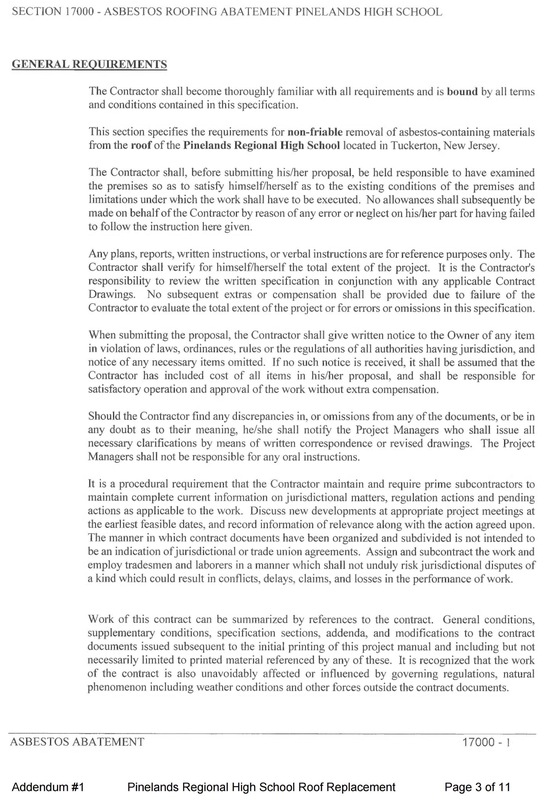 According to the contract between the district and the roofing contractor, Kobithen (the “Pinelands-Kobithen” contract), the first day of construction was June 19th. On September 10th, Epic Environmental reported that “it is assumed that the cleaning of the entire roof in the areas containing asbestos was incomplete.” Up to 17,000 square feet were left uncleaned. In these areas, new roofing material was applied directly on top of old roofing material and debris, some of which contained asbestos. It was also recently discovered that in at least “seven locations” the new roof was installed despite knowing that asbestos debris was sitting immediately below the rooftop panels. This made it impossible to clean or access the debris, except from within the rooms below. This resulted in the entire project being undone and then re-done, in order for the debris to once again be cleaned properly and in full. 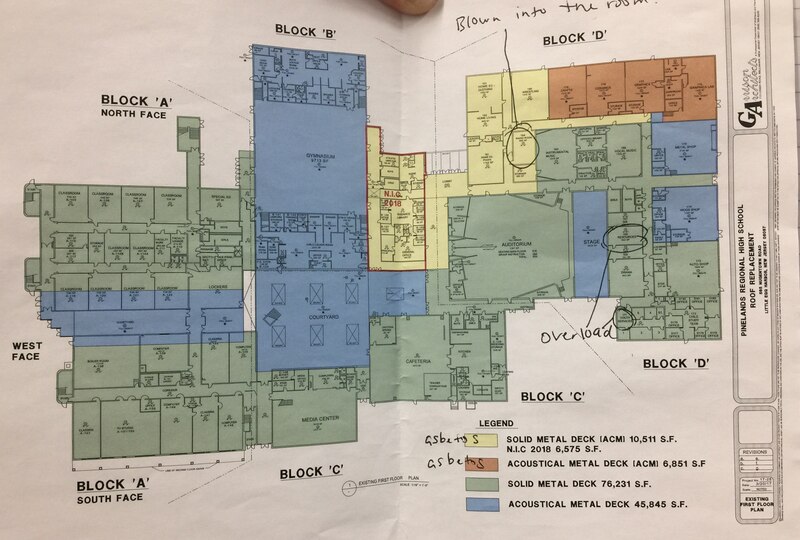 This re-do occurred at the beginning of October, after staff and students were exposed to contaminants for three full weeks. Diagram of Pinelands Regional High School. Asbestos was primarily found in the orange section in the top right corner. This is called the D-wing. 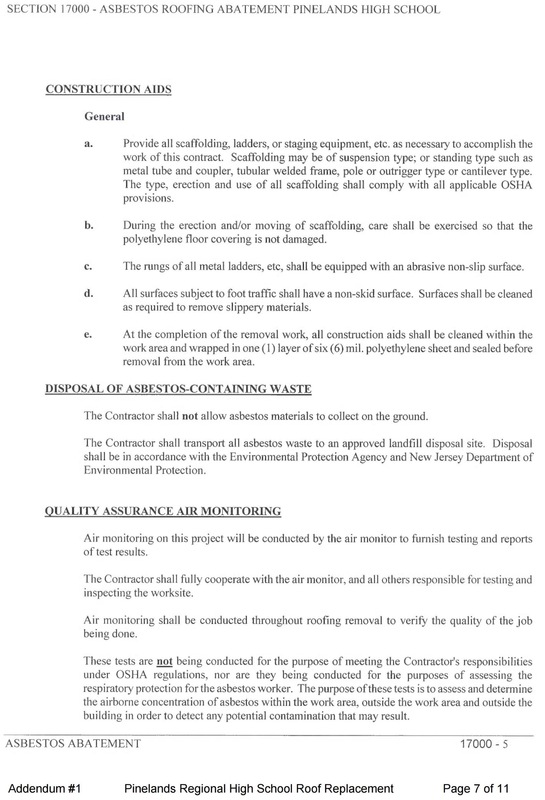 Asbestos remediation protocols (removal and disposal) are specified in section 17000 (page 418) of the Pinelands-Kobithen contract. Screenshots of this entire section can be found at the bottom of this article. 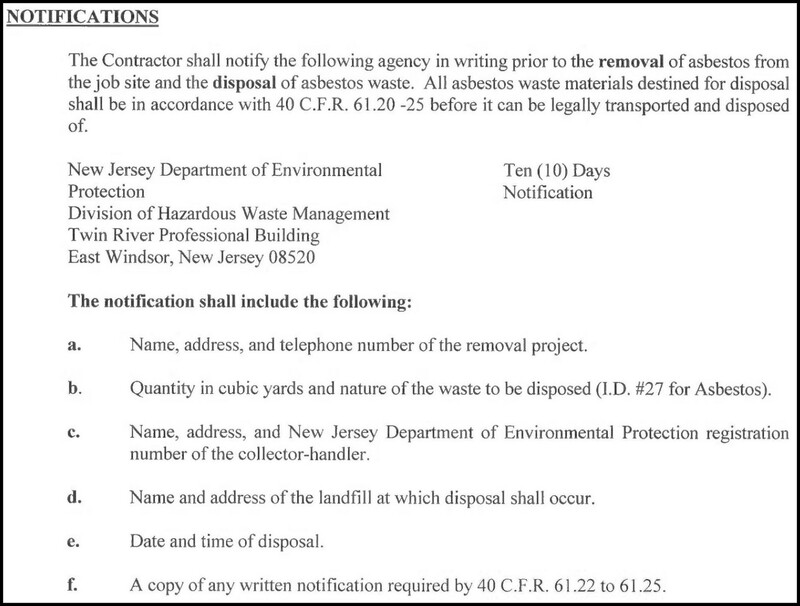 In this section, it specifies that advance notice of all asbestos remediation plans must be provided to the New Jersey Department of Environmental Protection at least ten days in advance. No plan was received. 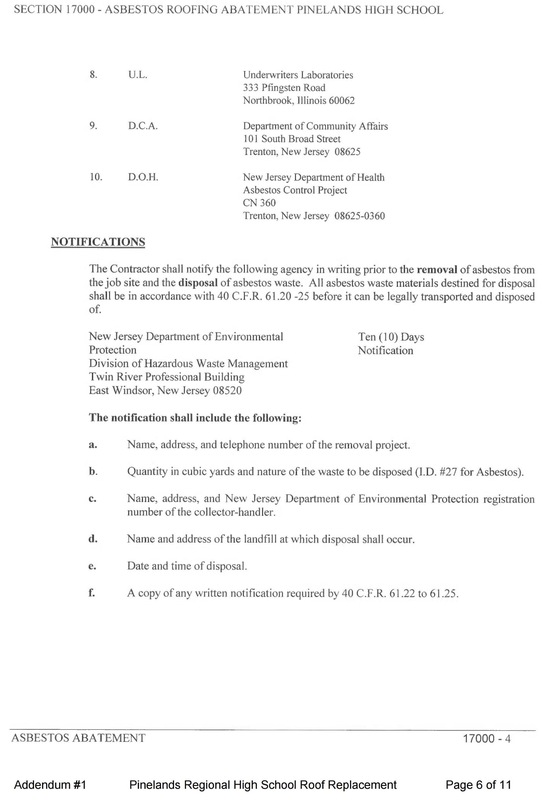 Citizens’ Media TV public-records requested (via New Jersey’s Open Public Records Act, or OPRA) any asbestos clean-up plan related to Pinelands Regional High School, at any point during the year 2017. We requested it from three separate state agencies and one county agency. Specifically, we first requested it from the: New Jersey Department of Environmental Protection (NJDEP). They suggested that it should instead be requested from the New Jersey Department of Labor (NJDOL), the New Jersey Department of Health (NJDOH), and the Ocean County Department of Health (OCDOH). All agencies responded with “no documents found,” or with documents that did not fulfill the request. We have also requested this document directly from the school district, but they have not responded. (Unfortunately, it was lost in the the chaos of Administrator Brennan being placed on administrative leave on November 7th, only to be reinstated a week later. We will resubmit the request after our pending requests have been responded to.) On the remote chance that the district’s response results in contradictory evidence, this article will be updated. 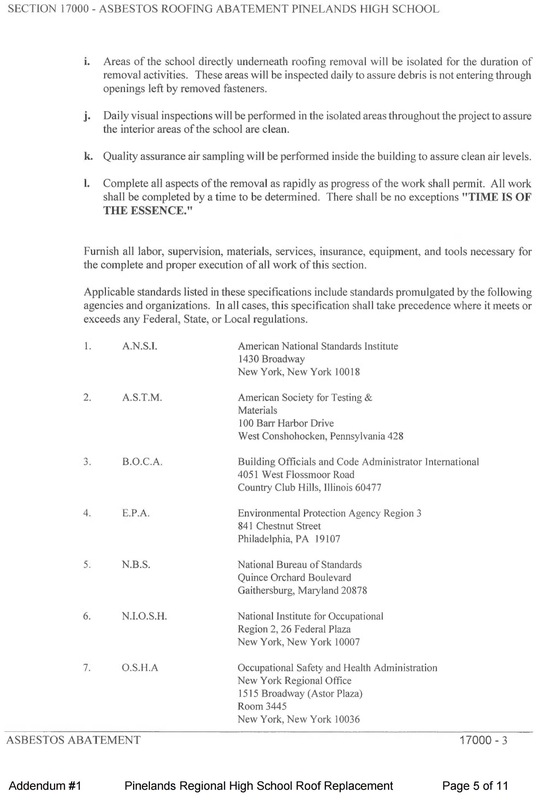 Here are all requests and responses from: NJDEP, NJDOL, NJDOH, and OCDOH. 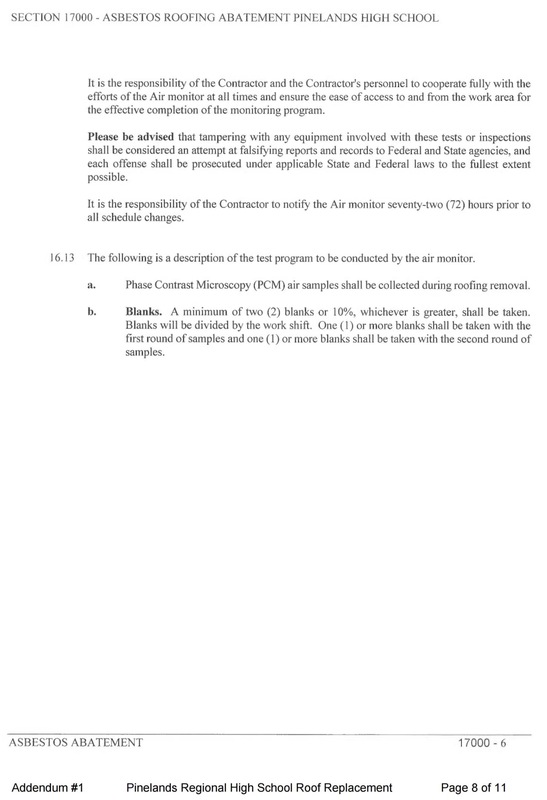 This is the full section 17000 in the contract, which begins on page 418 in the district-Kobithen contract).